Become certified in the hiring and recruiting process. Many business owners and managers know that the first step in employee retention is finding and hiring the right people. In today's tight labor market, companies are looking to thier HR department and expecting hiring and recruiting skills to be given. Its not easy and finding, hiring and placing the right employee is extremely difficult. 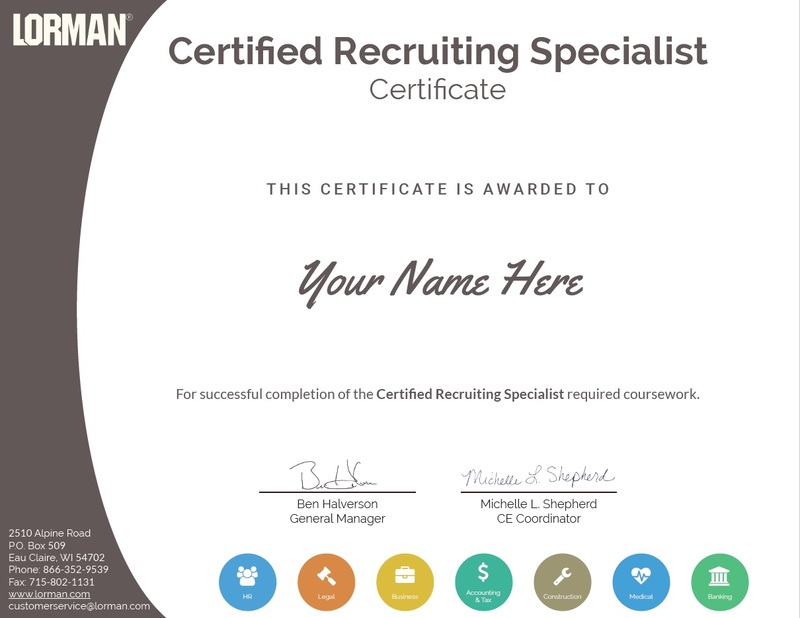 Our Recruiting Specialist Certificate is crafted with courses that will improve the performance of all the individuals involved in managing and working within the recruiting and hiring process. It provides HR Managers, supervisors and management staff with recruiting fundamentals, hiring compliance and tools to help with candidate searches. Courses that we have selected for this certificate are presented in OnDemand format. Each course was previously recorded live and is presented in our OnDemand presentation tool that tracks your participation and completion. Every Lorman course is taught by professionals that are experts in the industry. Earning the Certified Recruiting Specialist Certificate will give professionals the ability to showcase their continuing ability to learn, improve, grow and excel. After completing the series of courses, a certificate will be mailed to within 7 business days. 1. Complete all five courses required within 90 Days of date of purchase. Receive strategies on how to write an accurate job description and how to avoid the various legal pitfalls.Employers encounter many situations where it is critical to have a clear understanding of an employee’s job duties. If the employer does not have an adequate written job description before the employee is hired, it may face liability for disability discrimination and failure to accommodate, interference with FMLA rights, and increased workers compensation costs. This topic will explain how to identify essential functions and write effective job descriptions that can be used to limit the risk of liability. Faculty: John D. Bryan - Jackson Lewis P.C. & Lauren Hanson - Jackson Lewis P.C. Make sure your new hire is setup for success by job matching early in the recruiting process.Many hiring managers are dissatisfied with the pool of qualified candidates presented to them. However, they are not willing to participate in the recruiting process early enough to change the results. This leaves their Human Resource Department with conflicting hiring manager goals – do the same things while expecting different results. This topic helps the persons responsible for sourcing, screening, and engaging hiring managers early enough to make positive, measurable impacts in candidate job matches. The material also explains the method required for delivering the best qualified candidate to the hiring manager. Failing to verify information gathered is the most common error employers make in ensuring a great match. This information is critical for employers so they can ensure they hire the best qualified candidates who make a difference within their company. Faculty: Bill Humbert - Provocative Thinking Consulting Inc. Ensure the best results for your company by adapting these best practices to become a top recruiter. Many recruiters struggle with the stress of a commission based business where competition is fierce and clients don’t always give recruiters the respect they deserve for their hard work. Many factors can impact a placement which is outside of a recruiter's control and this can create frustration and disappointment. The long hours and endless emails can take a toll on our health as well and zap our energy and productivity. This topic will teach you how to dramatically improve your billings and boost your resilience and confidence. You will receive practical advice on how to become a successful recruiter as well as tips and tricks for new and existing recruiters. You will learn how to use emotional intelligence to build better client relationship and turn hostile prospects into loyal clients. Finally you will learn how to avoid endless cold-calling to get better clients using attraction marketing techniques that work and are not as time consuming or energy draining. Faculty: Patricia Conlin, HBA, RHN - Global Consulting Group Inc. Learn about the latest issues under VEVRAA and Section 503 Requirements.Many federal contractors are subject to the revised VEVRAA and Section 503, but often do not understand how to properly and effectively implement programs to accomplish the identified goals. More, federal contractors are finding it difficult to address issues highlighted in audits and stay afloat among the sea of regulations. This topic will take you back to the basics and help you build the foundation for strategizing with your organization on how to achieve goals while properly utilizing your resources. This content will also identify best practices when complying with the various regulations and highlighting key focus areas of the OFCCP. Many contractors have limited resources devoted to compliance and, thus, it is important that contractors wisely allocate their resources to ensure compliance while maintaining strategies to improve their diverse workforce. Faculty: Meredith M. Gregston - Ogletree, Deakins, Nash, Smoak & Stewart, P.C. & T. Scott Kelly - Ogletree, Deakins, Nash, Smoak & Stewart, P.C. Lorman Education Services has been training professionals across the United States and Canada since 1987. Learn from professionals that have pounded the pavement in your shoes. We work with only experienced and expert faculty. OnDemand Courses are available 24/7. You can stop, start and work between multiple devices as you complete courses. Contact our customer service team with any questions you may have. We are more than happy to help. I love the variety of courses offered. The training presentations are given by knowledgeable, well-respected professionals and are always useful and interesting. I love the flexibility of live webinars and on-demand presentations. Easy to fit into a busy schedule. Several options for educational opportunities, not just one format and a variety of topics. What I like most is being able to access the trainings when it is a good time of me and being able to go back and review them again. Also not having travel to a different locations. Looking for Other Recruiting Courses? 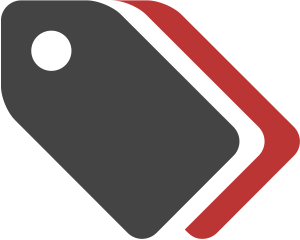 Check out all of our other Live and OnDemand Recruiting titles. Lorman has been around for over 30 years. That means we are no fly by night online training provider that you won't be able to count on when you need access to learning records and history. Trust Lorman with your training needs and we'll be here, when the rest isn't. We work with many small, medium and large companies across the United States. Let us help you save money on by purchasing an Enterprise Level Unlimited All-Access package. Our Enterprise level package keeps all the same benefits but gives you a whole lot more. Call us today and schedule a demo of our Unlimited Enterprise package today!